1. In a mixing bowl, combine the peanut butter, butter, vanilla, coconut, sugar and rice krispies. Mix until smooth. 2. Take about 1 tablespoon of dough and roll into a ball. Place on a cookie sheet that has been covered with parchment paper. 3. Place in the freezer. 4. In your Little Dipper Crockpot (or a small slow cooker) place your chocolate. Cover and cook on LOW or WARM, while the cookie dough is chilling. 5. Stir the chocolate until creamy. 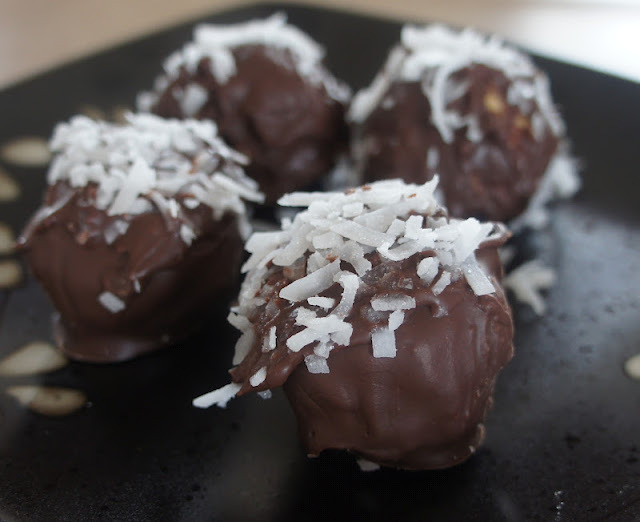 Dip cookie balls in the chocolate. Cover entirely with chocolate and place on cookie sheet that has been covered with parchment paper. Sprinkle with coconut, if desired. 6. Let chocolate set and then serve (or chill if desired). Mouth watering… These look absolutely delicious! They are delicious! Of course the coconut is optional. My oldest daughter doesn’t like coconut so I usually make some with it and some without. Are You in Tune With Your Partner’s Needs? The No Holds Barred, Solid And Simple Way For Anyone To Build A Profitable Blog! Why go through all the frustration when you can potty train in 3 days? Learn How To Publish A Successful Fashion Blog That Generates Steady Revene within 6 Months! From A Fashion Blogger Expert. Topics Include Blogging, Keyword Research, Driving Traffic, Monetization, Negotiation Skills, & Writing.